Director – Daniel Espinosa, Screenplay – Rhett Reese & Paul Wernick, Producers – Bonnie Curtis, David Ellison, Dana Goldberg & Julie Lynn, Photography – Seamus McGarvey, Music – Joe Ekstrand, Visual Effects Supervisor – John Moffatt, Visual Effects – Atomic Fiction Visual Effects (Supervisor – Wayne Brinton), Cheap Shot, Double Negative (Supervisor – Huw Evans), Industrial Light and Magic (Supervisor – Mark Bakowski), Nvizible (Supervisor – Adam Rowland), One of Us (Supervisors – Lars Andersen & Dominic Parker), Outpost VFX (Supervisor – Macin Kolendo) & Technicolor Visual Effects (Supervisor – Doug Spilatro), Special Effects Supervisor – David Watkins, Creature Consultant – Howard Berger, Production Design – Nigel Phelps. Production Company – Skydance. The six-person team stationed aboard the International Space Station retrieve the Pilgrim 7 probe as it returns from Mars with a soil sample. Upon examining the sample in the laboratory, Hugh Derry determines that it contains cellular life. Named Calvin by a school vote back on Earth, the sample grows into a blob-like form. However, when Hugh tries to spark it out of an inert state, it turns and attacks him, crushing his hand and cutting its way out of the laboratory container. Free, it kills members of the crew and then gets loose into the station’s air ducts. Now regarding Calvin as a hostile threat, the others try to eliminate it, only to discover that it has intelligence and more tenacious survival capacities than any of them expected. Ever since the substantial hits of Gravity (2013) and The Martian (2015), we have seen a vogue for space movies that depict real space with scrupulous scientific regard. The last couple of years have seen a wave of other such real space works as Europa Report (2013) and The Space Between Us (2017) and on the tv screen The Expanse (2016– ) and on tv the National Geographic channel docudrama series Mars (2016– ) and the dramatic series The First (2018). All of these never stray beyond what is called Mundane Science-Fiction – science-fiction that rejects more fanciful devices like warp drives and artificial gravity systems and are set around more scientifically-grounded and credible space travel within the limits of the Solar System. On one level, Life is no more than another variant on Alien (1979) – interstellar space crew pick up an alien organism that reveals malevolent intent as it rapidly transforms and takes over the spaceship, hunting and killing them. This is a source that the filmmakers readily acknowledge. The difference is that the venue and menace have been transplanted into the Mundane Science-Fiction movie genre of Gravity and The Martian. Thus the locale is not some alien planet and a deep spacegoing ore-carrier but the International Space Station. The alien is not a cliche creature with dripping black jaws and no eyes but a cellular entity that transforms into a shapeless mass. Director Daniel Espinosa captures one’s attention with a great establishing scene where his camera casually floats through the entire station, moving back and forward between different rooms and up and down to action occurring at different angles as the crew prepare for the reception of the Mars probe. Before Gravity came out, audiences would be wowing at something like that but now it has become an almost casually accepted part of the genre. From this point on, Life is construed as a series of set-pieces with the crew trying to deal with the alien organism as it attacks them. 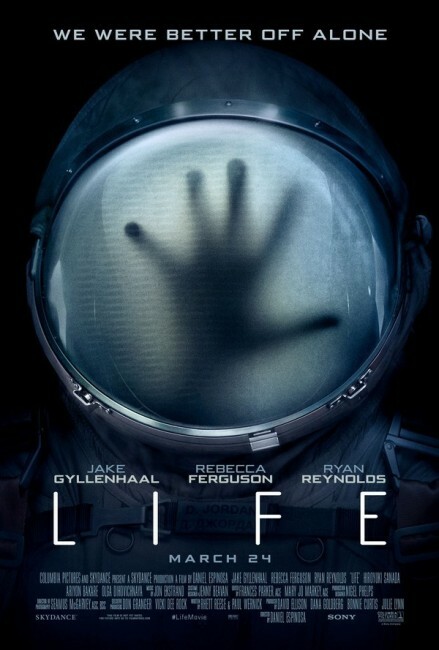 There is a dazzling scene with Ariyon Bakare probing the blob with an electrical rod only for it to turn and grab his hand, crushing it, finally releasing him and then picking up the snapped probe to cut its way out through the rubber glove, get loose in the room, absorb a lab mouse and then for Ryan Reynolds to enter after it with a blowtorch, only for it to force its way down his throat. 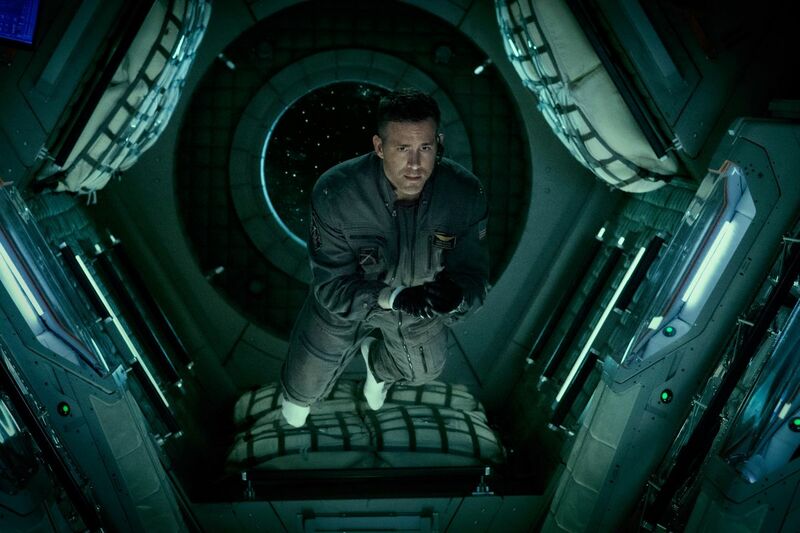 There is a very tense scene where Olga Dihovicnaya goes EVA in a suit to repair the communications antenna only for Calvin to emerge into the void and start trying to force its way into her suit, which requires her to make a tetherless jump back to the main body of the station at the same time as the coolant from her suit is blurring her vision. I’m a sucker for scientifically-grounded science-fiction and these Mundane Space movies hold a great thrill for me. Life never quite hits the awe-filled feeling of actually being in space that Gravity had or the pure pleasures of scientific puzzle-solving that The Martian held. Nevertheless, it does deliver the goods and moves well as a dramatically exciting spacegoing ride. Daniel Espinosa is a Swedish director of Chilean origin who had gained international attention with his third film, the thriller Easy Money (2010). He was brought to the US to make the crime film Safe House (2012), followed by the big-budgeted Soviet era detective story Child 44 (2015). The writing team of Rhett Reese and Paul Wernick had previously delivered the scripts for Zombieland (2009), G.I. Joe: Retaliation (2013) and Deadpool (2016).